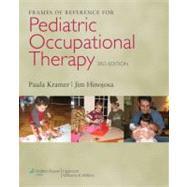 The Third Edition of Frames of Reference for Pediatric Occupational Therapy provides an exceptional foundation of theory and practical tools that will serve as the basis of pediatric occupational therapy practice. The focus of the text is on frames of reference, which offer effective blueprints for applying theoretical information to help pediatric clients lead richer, fuller lives. The Third Edition features updates of all theories and their practical application, with an emphasis on occupation and participation in life.